I will most definitely never claim to be a sun protection expert. I’m proud of my pastey whiteness, and a decent tan now and then, but in order to get a tan I usually get extremely burnt first. I never learn. (and I mean ever). But I’ve come to trust and rely on a few products within the massive range of sun protectors. 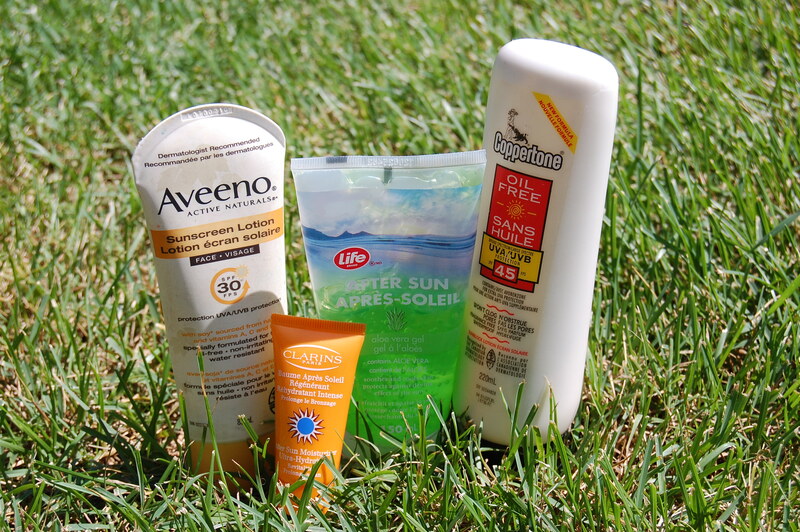 Most important is the Coppertone Oil Free Broad Spectrum UVA/UVB Protection (SPF 45). It says right on the bottle ‘won’t clog pores’ which is a seller right there. There is nothing worse than oily, greasy sunscreen that makes you feel gross and break out the next day. Gross. This sunscreen does what it says, non-greasy and non-pore-clogging. And SPF 45 is some pretty awesome sun protection. It’s also waterproof and fragrance free so no sunscreen smell (although I know some people like that). Now even though the Coppertone is oil free, I’m still weary about putting regular sunscreens on my face. I would usually put sunscreen on under my foundation, so I want something that isn’t too thick and that, if possible, is specifically formulated for face. Just in luck!! The Aveeno Sunscreen Lotion for Face is just that. It is made with soy and is a source of vitamins A, C, and E. Specially formulated for face, oil-free, water-resistant and SPF 30. Everything that I was looking for in a face sunscreen. And like all other Aveeno products it’s dermatologist recommended, therefore it’s great for those with sensitive skin. And then of course, there are those products for when it’s just too late. For when the damage is already done. Everyone has those days (*ahem* me yesterday) when they’re in the sun all day with absolutely not a single stitch of SPF anywhere on their body. So for those days there is the after sun routine. The layers upon layers of Aloe Vera. I’m not picky when it comes to brands of Aloe. I go through the bottle so quickly that I don’t spend the big bucks. Right now I’m using Life Brand After Sun Aloe Vera Gel which works just as well as any other I’ve tried. Soothing and cooling. But again, there is the face issue. I don’t want to slather Aloe on my face. So for those nasty face burns, I use Clarins After Sun Moisturizer Ultra-Hydrating. The cream is a little thicker and has a scent that I can’t quite figure out (not bad though) and I use this just as I would any other moisturizer. If I use it before bed I do feel slightly greasy in the morning, but after a quick face wash all is well. Burn is already turning into a tan, and no break-outs on my oh-so-sensitive face. ← What’s On My Face?